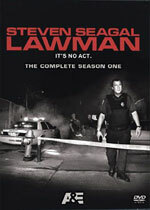 Lawman: Mystery and Suspense on Television. For almost 20 years, Steven Seagal has been working as a fully commissioned deputy with the Jefferson Parish Sheriff's Office in Louisiana where, in addition to going out on patrol, the expert marksman works with the SWAT team and instructs Jefferson Parish officers in firearms and hand-to-hand combat. Get in on the action as Lawman chronicles Seagal's extraordinary life in law enforcement, riding shotgun as he and his hand-selected team of deputies respond to crimes-in-progress.